WASHINGTON — More and more people consider “fresh” — not processed — foods to be important when they shop for groceries, and when it comes to freshness, Wegmans came out on top of Consumer Reports’ annual supermarket survey. The grocery chain topped the Consumer Reports’ reader rankings with an overall score of 90 out of 100. The ratings are based on 62,917 responses to the nonprofit’s 2014 Supermarket Survey, based on 111,208 shopping trips between March 2013 and July 2014. Readers of Consumer Reports rated grocery chains on four measures of freshness — produce quality, meats/poultry quality, bakery quality and store-prepared food quality — as well as two measures of store quality, staff courtesy and store cleanliness. Wegmans, top-rated by Consumer Reports readers since 2005, ranked No. 1 for freshest produce and meat/poultry quality, No. 1 for cleanliness, No. 1 for having the best in-store bakery and No. 2 for the cheapest organics. Trader Joe’s took the top slot for cheapest organic products. “There’s a growing rejection of overly processed and packaged foods, especially among younger consumers,” Jim Hertel, managing partner at supermarket industry consultant Willard Bishop, told Consumer Reports, in its May edition. 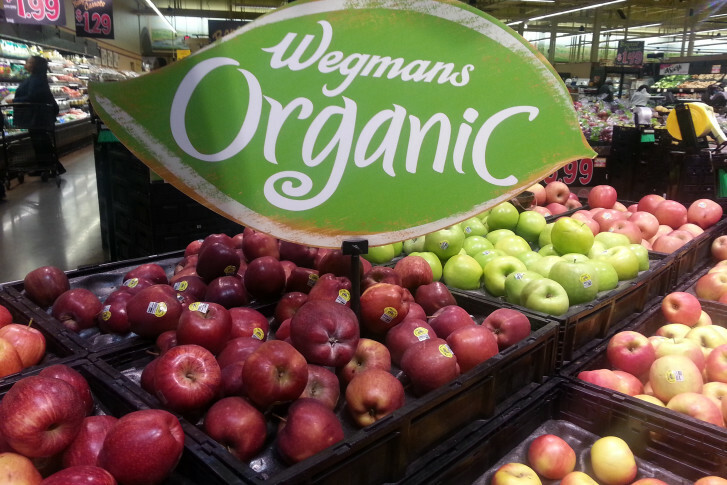 Only three chains — Wegmans, The Fresh Market and Whole Foods — earned stellar scores for produce. And overall, just six in 10 shoppers said they were completely or very satisfied with the quality of their store’s produce, meat and poultry. Overall, Aldi comes in at No. 14, Whole Foods at No. 15 and Harris Teeter at No. 17. Other groceries in the D.C. metro area appearing on the list of 68 chains include Shoppers Food & Pharmacy (No. 41), BJ’s Wholesale Club (No. 42), Target/Super Target (No. 45) and Sam’s Club (No. 47). Giant in D.C., Maryland, Virginia and Delaware appears on the list at No. 56, and Safeway is No. 58. While Consumer Reports says its survey’s results “don’t necessarily mirror the experiences of the general population,” Wal-Mart has consistently rated at the bottom of the rankings since 2005. It is No. 67 on the list of 68 chains. Waldbaums is No. 68.